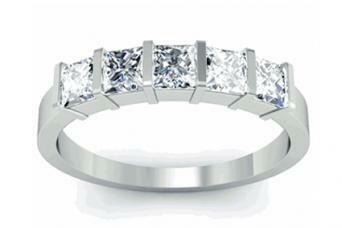 Princess cut diamond wedding bands come in a variety of styles and settings. Some are eternity bands that feature diamonds all the way around, while others are anniversary bands, which have a band of diamonds that stretches across the top of the finger. Choose your ideal ring based on your taste and lifestyle. Eternity bands make quite a statement, and they come in a variety of designs based on setting styles. When choosing this kind of ring, it is very important to select the correct ring size because re-sizing is not possible. Size also impacts price because larger rings have more diamonds than smaller ones. In channel set eternity bands, the princess cut diamonds are set flush against each other and held in place with a metal band that rings the diamonds at the top and bottom. It's a very sleek look and the sturdiest of the eternity bands. Eternity Wedding Bands allows you to build your own princess cut, channel set band. Precious metal choices include 14k and 18k white, yellow and rose gold, as well as platinum. The least expensive option is any color of 14k gold, while platinum is the most expensive. This site offers free shipping, and all bands come with an appraisal. Diamond weight and grades also factor into prices. The total diamond weights available are 1.00 carat total weight (cttw), 1.50 cttw, 2.00 cttw, and 3.00 cttw, and you can choose from three levels of color and clarity grades for the diamonds as well. Prices start around $1,295 for the 1.00 cttw of G-H color grade and SI clarity grade in 14k gold. Platinum in the same carat weight and diamond grades increases the price to around $2,080. The platinum, 3.00 cttw in the highest diamond grades is priced at $6,141, which make it the most expensive option. 25 Karats offers bold, channel set eternity bands that total 2.30 carats up to 3.25 cttw. Available metals include 14k and 18k white and yellow gold, platinum, and palladium, which is a less expensive metal from the platinum family. The diamonds are graded at G-H color and VS clarity. This store offers a 30-day money back guarantee and free shipping within the US. You can also take advantage of a customized design process you can use to create a one-of-a-kind ring. The 14k gold band totalling 2.30 cttw is the least expensive option and sells for around $4,295, while the 3.25 cttw equivalent sells for just over $6,400. The platinum 2.30 cttw version sells for about $4,745; the price is around $6,450 for the 3.20 cttw. 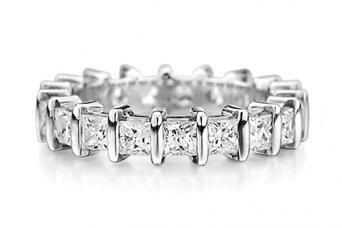 In prong-set princess cut eternity bands, the diamonds are held in place at each corner. 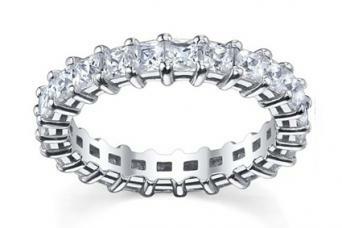 My Jewelry Source has prong set eternity bands around the 2.00 carat total weight. Select 18 karat white or yellow gold, or platinum. The diamonds are only available in G-H color grade and SI clarity grade, which is the recommended color and clarity grade for diamonds of this carat weight. The gold version sells for $6,800, and the platinum version sells for $8,800. At deBebians, you'll find a 3.00 cttw band in 14k or 18k white, yellow, and rose gold. The diamonds are F-G in color and VS in clarity. The ring sells for $4,537 in 14k gold of any color, and it sells for $4,861 in platinum. The band comes with an appraisal, and deBebians offers a layaway option too. 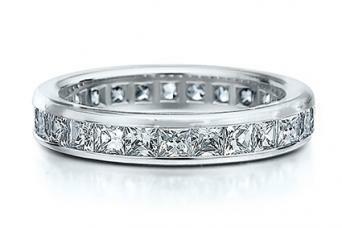 In a bar set eternity band featuring princess cut diamonds, the setting contains a bar between each diamond. 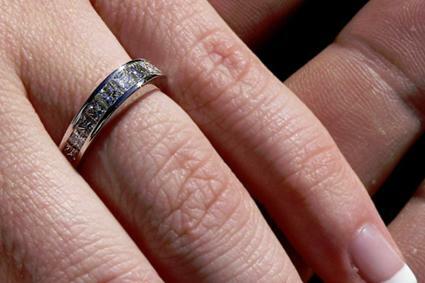 Eternity Wedding Bands' customizing options let you create your own princess cut, bar set band. Metal choices include platinum and 14k or 18k white, yellow and rose gold. Total diamond weights range from 1.00 cttw to 3.00 cttw with varying levels of color and clarity grades available. In any color gold, 14k is the least expensive choice while platinum is the most expensive. Total diamond weight and diamond grades will factor into price. The prices for a 2.00 cttw of G-H color grade and SI clarity grade in 14k gold runs about $2264. The platinum 3.00 cttw (the most expensive option) in the highest diamond grades is priced just under $5,475. 25 Karats offers a 2.89 carat total bar set band. This ring is available in 14k and 18k white and yellow gold, platinum, and palladium. The band's price ranges from just under $5,800 to around $6,600, based on the metal. The diamonds are graded as G-H color and VS clarity. The diamonds will always show on an eternity band, even when the ring rotates around your finger. This is a very bold style band that's bound to draw attention. Eternity bands are a bit more delicate that other styles because the side that faces the palm is often subject to more wear and tear. Re-sizing is not an option, or at least will be very difficult, with this type of ring since there are diamonds all the way around the band. Anniversary bands are similar to eternity bands, except diamonds only cover part of the band. These rings are available in the same kinds of settings used for eternity bands. The front of this style of ring features princess cut diamonds set flush against one another. The metal band surrounds the stones above and below. Anniversary bands are available on Blue Nile in various total carats weights from 0.33 cttw to 1.00 cttw, and in 14k white gold or platinum. The diamonds are graded at H color and VS 2 clarity. 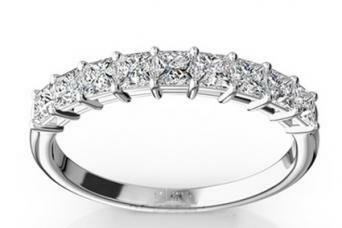 Blue Nile is famously accommodating to special requests if a particular ring is not featured on their website. The 0.33 cttw, 14k white gold band features 14 princess cut diamonds and sells at $910, which is the least expensive option. The platinum, 1.00 cttw band features nine princess cut diamonds and sells at $2,990, the most expensive option. Eternity Wedding Bands lets you choose from various options to complete your ideal princess cut, channel set anniversary band. Bands come in 14k and 18k white, yellow and rose gold, and platinum. Diamond weight and grades factor into the price, and total weight options range from 0.25 carat to 2.00 carats with three diamond color and clarity grade choices. The least expensive option is the 0.25 cttw band in 14k with G-H color grade and SI clarity grade diamonds that sells for under $450. The 2.00 cttw platinum band with the highest color and clarity grades sells for about $5,250. This style features princess cut diamonds with prongs on the corners of each stone set across the front of the ring. 25 Karats has numerous options based on the total carat weight of the diamonds. Note how the carat weight is similar, but the diamond count and the size of the individual diamonds vary. Select the carat weight in a five, seven, or nine diamond count, and choose from 14k or 18k white or yellow gold or platinum for your setting. Diamonds are G-H color and VS clarity grade. Prices vary from less than $1,000 to over $7,000. Zales has prong set anniversary bands that range from 0.25 carat total weight to 1.00 carat total weight in 14k white gold. The bands are featured with five or seven princess cut diamonds and range from around $770 for the 0.25 cttw band to about $2,700 for the 1.00 cttw band. The diamonds are G-H color grades and VS2-SI1 clarity grades. Zales offers a 60-day return policy, but charges for shipping. There's a bar between each princess cut diamond in this setting. Zales has bar set anniversary bands from 0.50 cttw that sell for around $1,350 to 1.00 cttw designs that sell for about $2,700. The diamonds are G-H in color grade and SI clarity grade. At deBebians, you can build your own bar set band with the desired total carat weight of princess cut diamonds and various metals including 14k and 18k white, yellow and rose gold, and platinum. The least expensive version features five diamonds that total 1.00 cttw in 14k gold for about $2,000. The platinum 3.00 cttw version sells for a bit over $7,500. This retailer offers a layaway option. Anniversary bands are more durable than eternity styles because the diamonds are meant to rest on top of you finger. You can spend the same amount of money on an anniversary band of the same carat weight and metal as an eternity band, but you'll get a bigger look since the anniversary band uses half the number of diamonds. Anniversary bands are usually less expensive than eternity styles. Bands have a tendency to spin, so the diamonds could spin to the bottom (which can be annoying). Anniversary bands are usually made for your finger size. Re-sizing is possible (but not recommended) for prong set and bar set styles, and will be difficult for the channel set style. Shopping for a princess cut diamond wedding band is a little different than shopping for a princess cut diamond engagement ring. Keep the following points in mind. The most important detail to consider is how well-matched the diamonds are when viewed face-up with the naked eye. When diamonds are aligned in a row, like they are in wedding bands, they need to be uniform in size, cut, and color grade. Prices for all styles of bands are based on the total diamond weight in the band and the type of metal used. The color grade of the diamonds will factor in as well as the clarity grade. A high clarity grade is not necessary for diamonds that are this small. Princess cut wedding bands can also be paired with colored gemstones, like sapphires or rubies, to create a ring that's distinctly yours. Another option is to have double rows of the designs above. With so many options and prices, there is a band for everyone's price range.